This lovely pink poet's dress reminds me of my favorite style of vintage dress - collared shirt dresses with pretty pleat details and simple tie-belt. 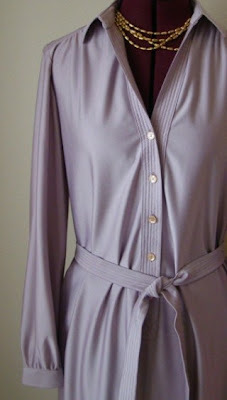 A perfect example is the 1970's Schrader Sport Shirt Dress in lavender (below.) I found the exact same dress in fuchsia several years ago at a thrift store in Florida. I don't know what it is about this particular style but I definitely have a penchant for them. Maybe it's the simplicity of the design coupled with the fact they're so comfortable to wear.